I spent three straight days in Grand Rapids for work last week. I haven’t done that in a long time. I still go up there occasionally but some wacky schedules had me going up there three out of the five days. I knew I was going to get home late so J took the kids out to dinner with a bunch of her friends. She offered to bring me home something to eat but I said I’d just grab a pizza on my way. When I worked in Grand Rapids every night, I ate at Grand Rapids Pizza & Delivery quite often. It wasn’t great pizza but it was close to work and it was the greasy, doughy pizza that fills me up pretty quickly. Grand Rapids Pizza & Delivery no longer exists but a new pizza place took it’s place. 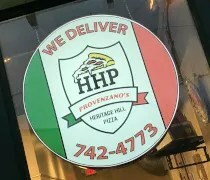 Heritage Hill Pizza is on the corner of State and Prospect in Grand Rapids’ Heritage Hill Neighborhood. This new pizza place shares a building with Beijing Kitchen just like the old pizza place did. 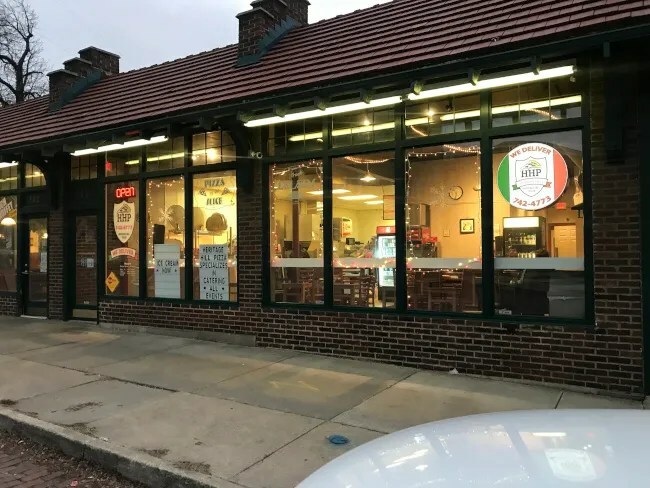 It’s a neighborhood pizza place in an old brick one story building with the only option to park is at meters along the surrounding streets. 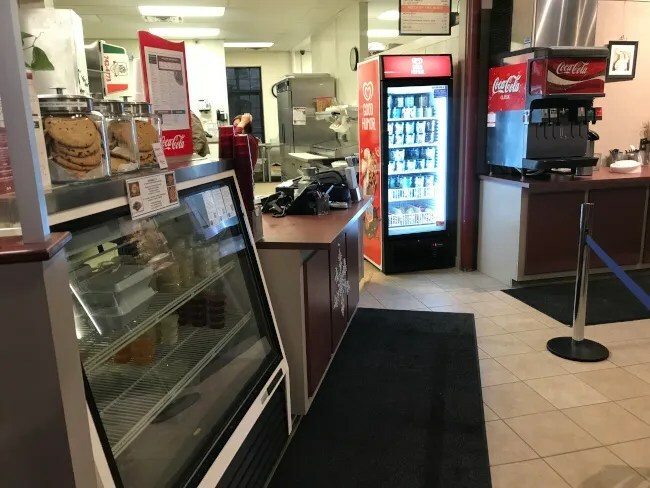 The business was sold late last year to a family that has worked in pizza for years. The Provenzano family owned a place in Jenison at one time as well as Joe’s Pizza in Plainwell. They kept a lot of the things from GRPD but also brought their own thing to the place. I started putting in my order using their online ordering system but it’s pretty damn awful. I couldn’t find anyway to get to my cart after I clicked out of it to keep looking. I tried adding something new then deleting it but it wouldn’t let me delete anything. After a browser refresh, I got what I wanted and tried to order and it kept erroring out. I finally gave up and just called. I almost gave up and just ordered somewhere else because I was getting so frustrated. 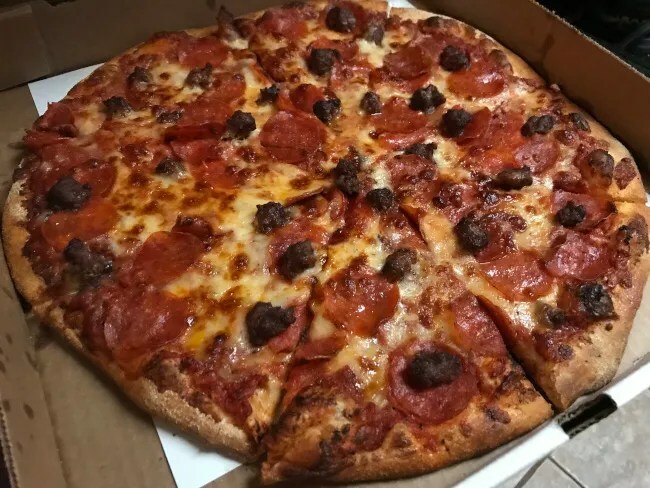 I finally got my order in for 14″ thin crust pizza with pepperoni and ground beef. The guy on the phone told me it would be about 25 minutes and cost right around $18 before tip. The pizzeria offers carry-out, delivery, and dine-in. Everything in the store is done at a counter right when you walk in. This is the same as it was with GRPD. The small counter right near the kitchen so when I gave the guy my name, he turned around and pulled the pizza out of a warming bag right next to the conveyor oven. The dining room is also pretty similar to what it was with GRPD. 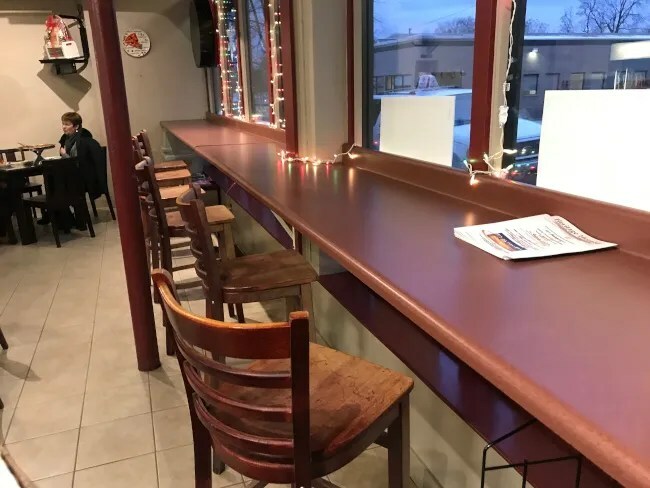 There’s a counter facing out the window looking at State Street plus a number of four top tables in the remaining space. It’s not a huge dining area but big enough for a couple of groups to hang out and enjoy some pizza. I ate one slice of my pizza sitting in my car just outside the restaurant because I wanted to eat at least one slice hot….also, I was super hungry. The rest of it would wait until I got back home to Kalamazoo. The pizza was pretty well done which I really like. The thin crust pizza was very crispy around the edges and the cheese on top was a delicious golden brown. The meat on top was also a very crispy golden brown. 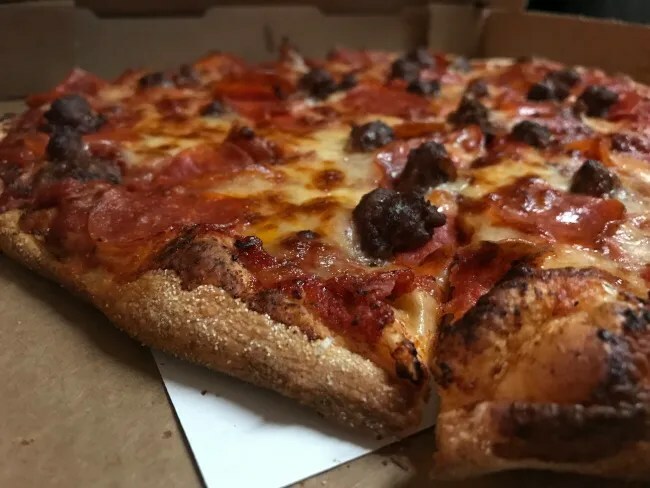 The cheese and meats all gave off a little grease which pooled near the center of the pizza and added a little delicious sheen to the pizza. The pizza from Heritage Hill Pizza was exactly what I was hoping for. It’s a delicious, fairly cheap pizza. This pizza isn’t really much like what GRPD offered before nor is it really similar to the pizza I had from Joe’s Pizza in Plainwell. I used to eat at GRPD because it was close and was always happy with it. If I still worked in Grand Rapids all the time, Heritage Hill Pizza would be getting more business from me. I definitely see my self stopping there for dinner on my way home on the days I end up finishing my shift in Kent County.